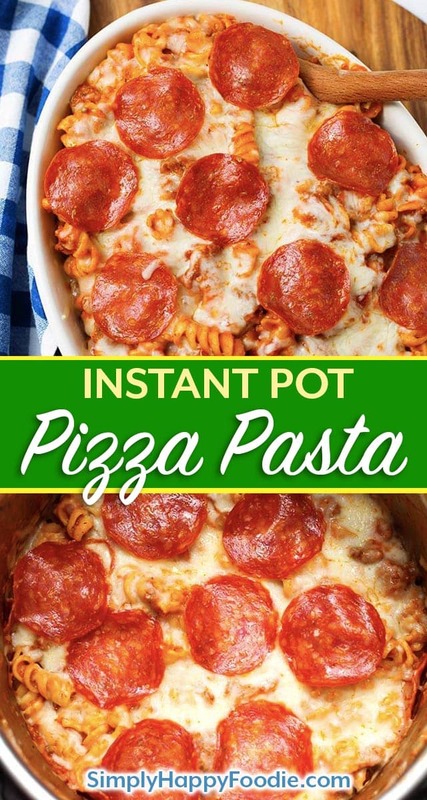 Instant Pot Pizza Pasta Casserole is a delicious, hearty one-pot meal. 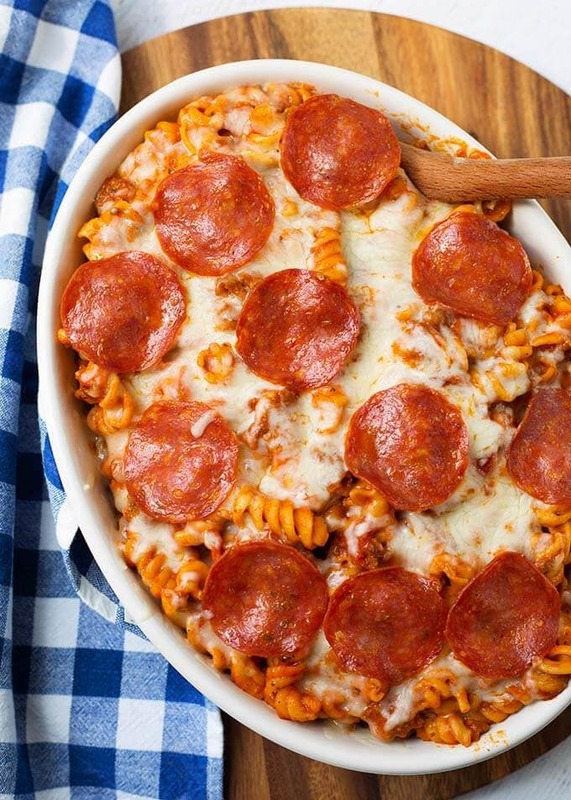 Made with your favorite pizza toppings, and pasta, you can make this pressure cooker pizza pasta casserole in under an hour! 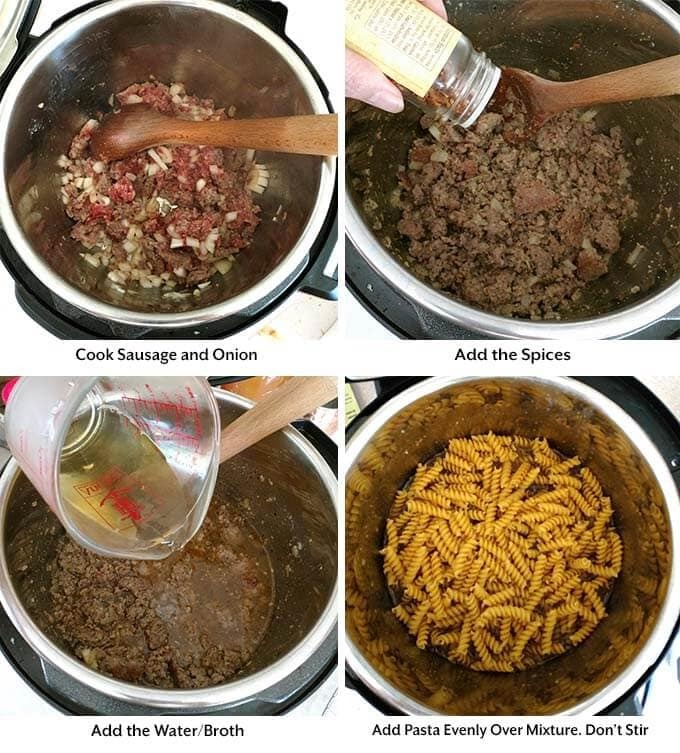 This is very similar to a Pizza Pasta Bake recipe. I love pizza! I also love pasta. So combining the two into one excellent one-pot meal is a win-win! 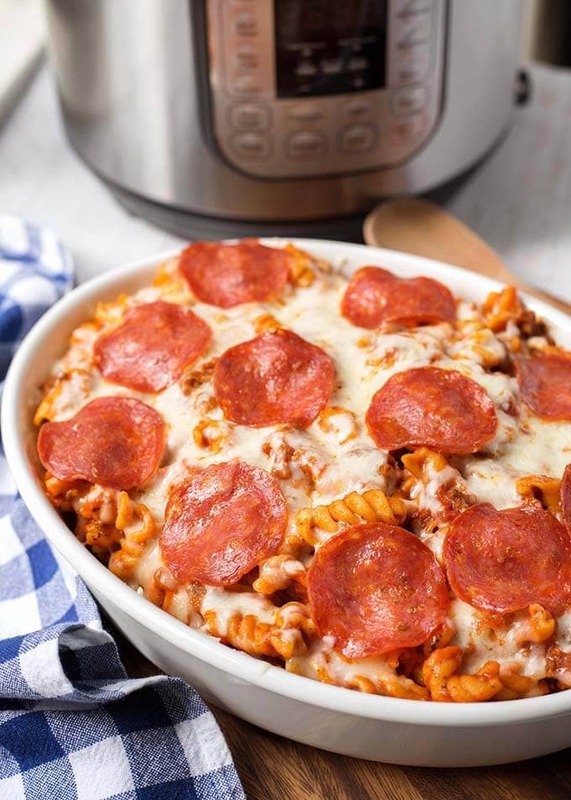 You can make this Instant Pot Pizza Pasta Casserole completely your own by using your favorite pizza toppings. If you have never made pasta in your electric pressure cooker, let me tell you that it is so easy! The thing to remember is to layer the ingredients, and there are some steps where you don’t stir it. Since the Instant Pot heats up on the bottom, food can scorch on the bottom of the pot and keep it from coming to pressure. So, the layering (and deglazing) is how we prevent that from happening. I like to use marinara sauce for Instant Pot Pizza Pasta Casserole. I add Italian seasoning and oregano to give it the pizza sauce flavor. My favorite Marinara sauce for this recipe is Newman’s Own Marinara. I buy several jars whenever I see it on sale. That way I am all stocked up. I’m not affiliated with them, I just like their sauces and dressings. And they are nonprofit. If you have some fresh tomatoes to use up, you can make my Instant Pot Marinara Fresh Tomato Sauce. It is easy and really delicious! 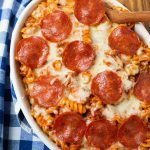 This Instant Pot Pizza Pasta Casserole is a wonderful party or potluck dish. It is budget friendly, and will also feed a good sized family. Pair this pasta dish with some bread and a salad, and you have a terrific meal! I think this Instant Pot Pizza Pasta Casserole might be my favorite pasta recipe for the Instant Pot! I have many other pasta recipes here on the blog. Just do a search and you will find them! 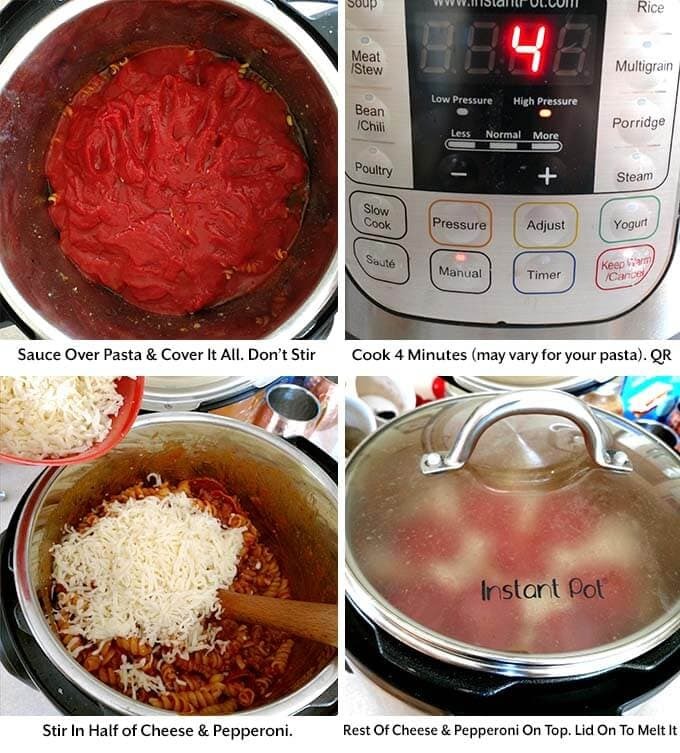 Instant Pot Pizza Pasta Casserole is a delicious, hearty one-pot meal. 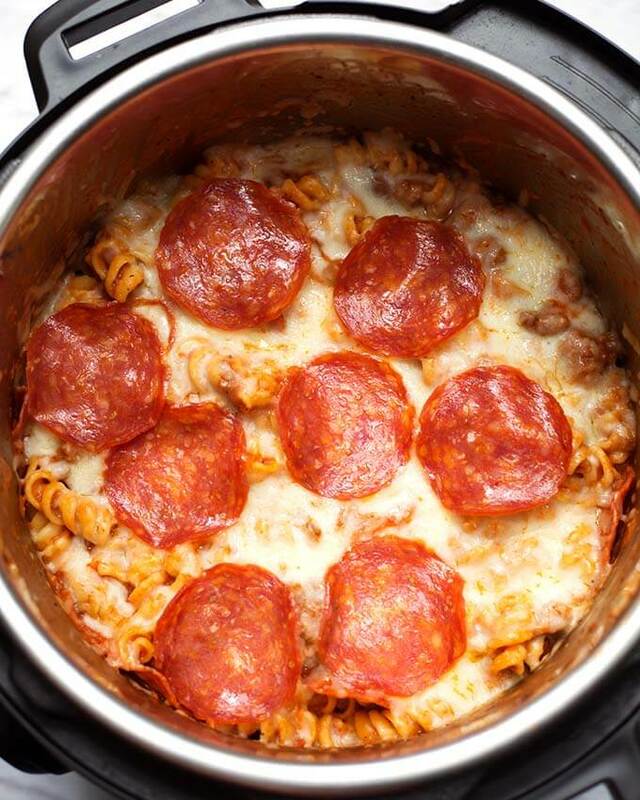 Make this pressure cooker pizza pasta casserole with your favorite pizza toppings, and in under an hour! I used the 6 quart pot, but you can also use the 5qt or 8 qt. Turn on pot to the Sauté setting. Add the sausage and onion. Cook until the meat is cooked through. Add Italian seasoning, oregano, garlic powder (or garlic), red pepper flakes, salt, pepper, and bell pepper, and mushrooms, if using. Stir. Add the broth or water and stir, scraping the bottom of the pot to deglaze (get up any browned bits). Add the pasta evenly over the mixture. Do not stir. Pour the marinara sauce over the pasta and cover it completely. Do not stir. Cancel the Sauté function. Put the lid on the pot and turn the steam release knob to the Sealing position. Press the Pressure Cook (Manual) button or dial, and then the +/- button or dial to select 4 minutes (for rotini). If you use a different pasta, set the cook time to half the time the package directions say to cook for. When the cook cycle is finished, do a Quick Release of the pressure/steam by turning the steam release knob to the Venting position. When the pin in the lid drops down, open the lid and stir the pasta. Stir in half of the cheese and 3/4 of the pepperoni. Stir in olives, if using, or any other add-ins you'd like. Sprinkle the remaining cheese on top and arrange the remaining pepperoni on top of the cheese. Close the lid and let the cheese melt. Serve from the pot or transfer to a casserole serving dish. Delicious! I added olives and mushrooms and it was amazing! My husband said he’d like this every week! Nice, Hannah! I am glad you both liked it! This turned out awesome! My kids had second helpings. Really good. Hi Karen! I always say that it’s a winner when the kids eat their dinner, lol! I’m happy you all liked this recipe! Made this last night and it was awesome!! Thanks so much for the recipe. I wonder how to transfer to a casserole? If I’m using double the amount of pasta do I need to adjust how much broth I use or the amount of time the recipe calls for? Hi Matt, Yes, you will need to keep the pasta/liquid ratio the same. I usually use 1 cup of liquid per 4 oz of pasta. The cook time will remain the same. Do you think this will turn out ok with a gluten free pasta? It’s a gf rotini, Barilla brand and its very similar to regular pasta. It’s worth a try. I would cook for 2 minutes less than half of the recommended time on the package instructions, and if it’s too al dente, put the lid back on and let it sit for a few minutes to finish cooking.